The last few day have brought so much rain that I nearly began building my own ark. Branches and leaves are covering the roads, drainage ditches are swollen and overflowing, and the ocean has been a swirling angry mass. Today however, it's a new world! We woke to a brilliant sunshine with stunning clear blue skies. Sending my son outside with a rake, Liv and I headed back to the kitchen for a little more treat making. With our swaying palms looking so tropical and glistening in the sun, we chose a Hawaiian themed Macadamia Nut Brittle. Studded with a chopped mac nuts the perfectly crisp toffee-like candy only takes half of an hour start to finish (well...except for the cleaning the dishes part!). With the leaves raked and bagged my hungry 14 year old son returned to the house and immediately smiled as he reached for a chunk of the toffee. Leaning back in his chair with a satisfied grin he said, "Ahhh... I knew you loved me!" Watching him reach for a second piece, I know all is good... Happy Holidays my friends! Lightly oil a baking sheet or line with a silicone mat. In a heavy saucepan, combine sugar, brown sugar, corn syrup and water. Cook over medium-high heat, stirring constantly, until a candy thermometer placed in the syrup near the center of the pan reads 260º. Add the butter and salt and continue to cook until the temp reaches 295º. Remove from the heat and stir in the macadamias, baking soda and vanilla. Note that the baking soda will make the mixture bubble up for a minute or two, so be certain to use a large pan for this candy to avoid sticky overflows. Pour the brittle onto the prepared baking sheet and spread to a 1/4 inch thickness. Cool completely at room temperature, then break into pieces. Store in an air-tight container. Note: the pan will look as though it is ruined with hard, sticky toffee stuck to it. Let the pan cool, simply fill with warm water and walk away! About 15 minutes later the sugar will have dissolved and the pan and spoon will come clean with minimal effort! The rain has been crazy the past couple days. What a great idea to make a tropical treat to remind us that there IS a sun out there.... somewhere! I do love brittle - it's a good thing I'm not there, otherwise I would eat it all. This looks way too good. Only 30 minutes and my husband's on dish duty anyway - can't beat that. Wowwwwzaa! That looks amazing! What beautiful pictures too! I would devour this brittle. Merry Christmas Kim! Your brittle looks divine. I'd be reaching for seconds too. Happy Holidays to you too. Oh my, that looks fantastic. I love macadamia nuts. Merry Christmas to you! You've got rain, we've got snow...a perfect day for staying in and cooking/baking! 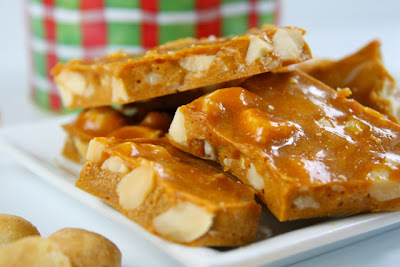 :) The brittle sounds really good...I always make it with peanuts...need to give the macadamias a try! It looks like I'm not the only one that loves it! I'm sorry about all the rain but I'm glad that you are all enjoying each other. Much love to my girl and your family...Merry Christmas! WOW - this looks and sounds incredible. Two of my favorite things all rolled into one. I am making this soon. Happy Holidays!! The rain was very crazy and the sunshine today was a wonderful site. Your brittle looks fantastic! Merry Christmas! Glad there was no damage done to your home! Your Macadmia brittle looks so good! A good way to celebrate the return of the sun and end of the rain. Have a Merry Christmas and Happy New year! 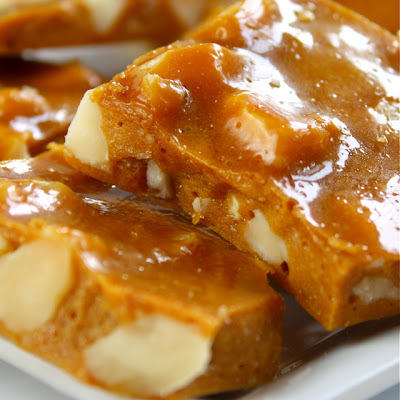 This Macadamia brittle looks fantastic. Great idea. I want to make this soon! Kim, this would put anyone in a good mood. I was so thankful for the sunshine today, I stood at the window working with my back to the sun, just to enjoy it! Wishing you and your family a Very Merry Christmas and Happiest New Year! 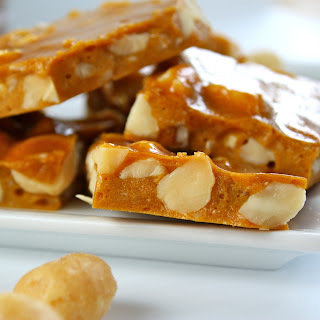 I love macadamia nuts and your brittle is just perfect. Once I discovered how easy brittle and toffee are to make, I never looked back. Such a great addition to Christmas. I love the macadamia nuts in these, delicious! Wonderful brittle! I love macadamia nuts as well, what a nice combination! Merry Christmas - another Top 9! 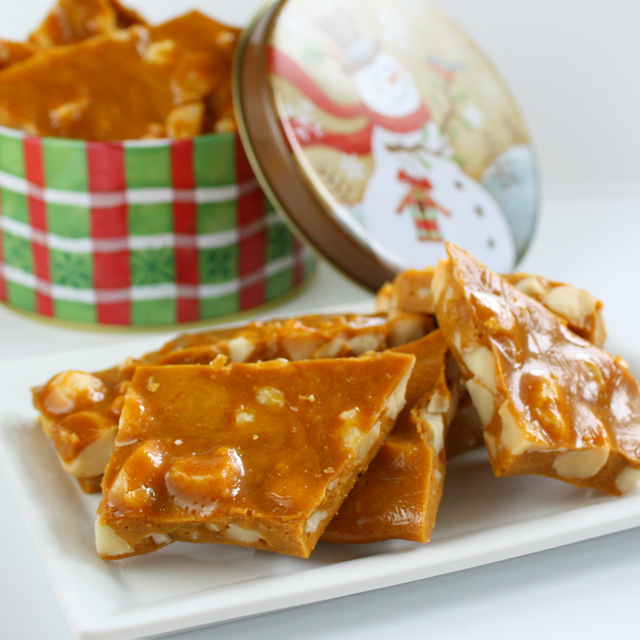 I love the idea of macadamia brittle. I'm not big on candy-making but this sounds delicious and a bit unexpected. Thanks for sharing. Hope you're having a lovely rain-free Christmas! What a great take on brittle! Try to stay dry and enjoy your holiday! What a fun twist on brittle. Merry Christmas. Kim-What a beautiful brittle, so perfect, and yummy. Hope you had a wonderful Christmas day, full of joy, good food, with loving family, and friends! Love the recipe, and would like to make this soon. Love macademia nuts. Can't wait to try it! Kim, I'm so glad you brought this from the archives...I LOVE macadamia nut brittle, and your photos bring to mind the scent of buttery nuts blanketed in a sweet candy crunch. I'll be bookmarking this for sure. Mele Kalikimaka!